The most popular indestructible mod is back! 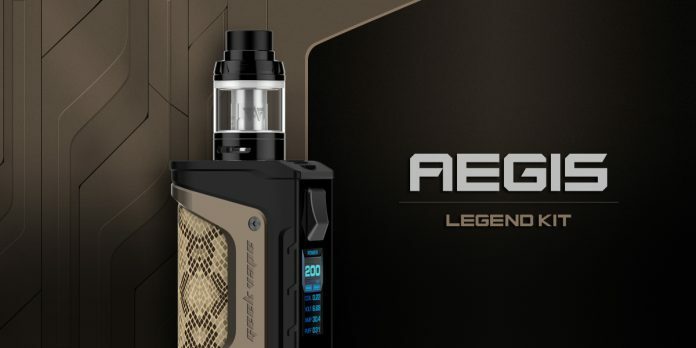 Geekvape just announced the release of Geekvape Aegis Legend TC Kit, 9 months after they launched the Aegis mod. Like the original version, this box mod also claims to be water and shock resistant as well as dust-proof. So the big question is… What’s new? What’s new with Geekvape Aegis Legend TC Kit? The Aegis Legend is slightly bigger than the original Aegis and it is powered by dual 18650 batteries. The original Aegis was powered by a single 18650 or 26650 battery and was only able to reach 100W. That was more than enough battery life and power for many vapers, but it looks like Geekvape wanted to increase both the wattage (200W) and the battery life (dual 18650) in the new Legend version. The Aegis Legend keeps the aesthetics, the durability, the AS Chipset and the portability. In short, it is almost the same box mod but with better battery life, more watts and a USB charging port. How much will Geekvape Aegis Legend TC Kit cost? The Aegis Legend will be available in 5 different colours: silver, black and orange, snakeskin, camo and stealth black. The mod will be available in a kit with the Aero Mesh Sub Ohm Tank in both Standard and TPD Edition. The Aegis Legend mod costs around $60 and is already available for pre-order on some vaping websites. Together with the Aero Mesh Tank, you can find it for around $80. Of course, you will always save some money if you wait until most vendors have it in stock. In my opinion, this is a great price for what you get: a very reliable and solid mod that will last a very long time even if you hit it, drop it or soak it. GeekVape already confirmed that the first Aegis Legend Kits will be shipped out by the end of April. So you might expect to see this kit in vaping shops by the beginning of May 2018. The Aegis Legend will be available along with the Aero Mesh Sub-Ohm tank. The original Aegis was available as a full kit with the Shield Tank. This time, Geekvape went for Mesh coils. I personally love this type of pre-made coil as they deliver a decent amount of vapor while keeping an outstanding flavour. But if for any reason you don’t fancy Mesh coils, don’t worry as the tank gives you another classic coil option! All in all, the Aegis Legend Kit looks like a winner. Although I have not had a chance to try it myself yet, it is difficult to go wrong with a Geekvape product. I own the original Aegis and it is still one of my favourite mods and the one I always pick when I am going to the beach, swimming pool or to the mountains. The Aegis is the most solid and durable mod I own. I even dropped it from the second floor of my work building and it still works fine after almost a year. Nonetheless, we will post a full review for the Aegis Legend once we get a chance to try it!